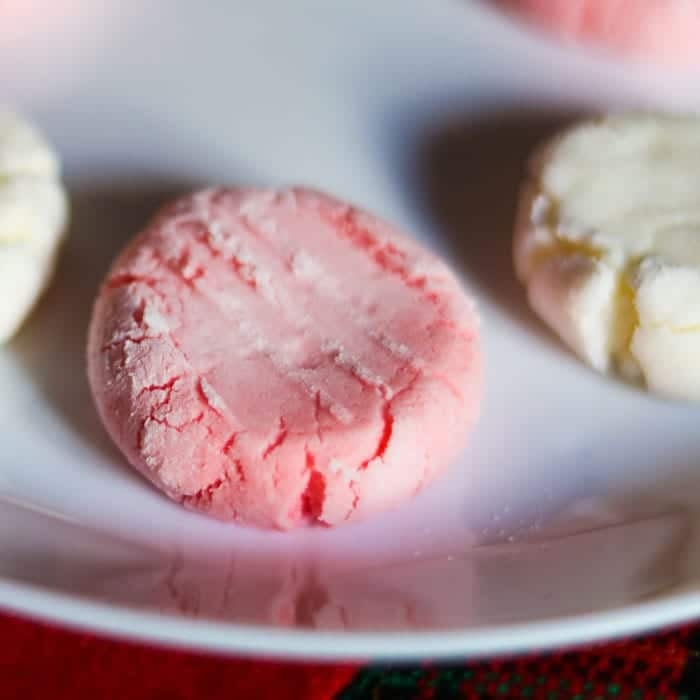 As a kid, I distinctly remember helping my mom and Aunt Kim prepare one of my favorite treats — Cream Cheese Mints. They’re visually satisfying with the perfect level of sweetness — each one just melts in your mouth. 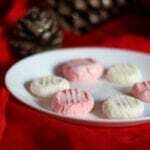 Since I will be using this recipe around Christmas, I’ve chosen to make mine red and white, like a candy cane. With different food colors, they can be done up for just about any celebration. Specifically, I remember having these at weddings, baby showers and birthday parties! The original cream cheese mints recipe calls for cups of powdered and granulated sugar. With a few low carb modifications, my new recipe is totally suitable for a Keto diet. For an extra special dessert, use a candy mold with your favorite shapes. Hearts and bells were common during weddings when growing up. For this recipe, I went the traditional route and just used the tines of a fork to flatten and mark them. If you decide to try this method, I find that using a fork dipped in erythritol works great. 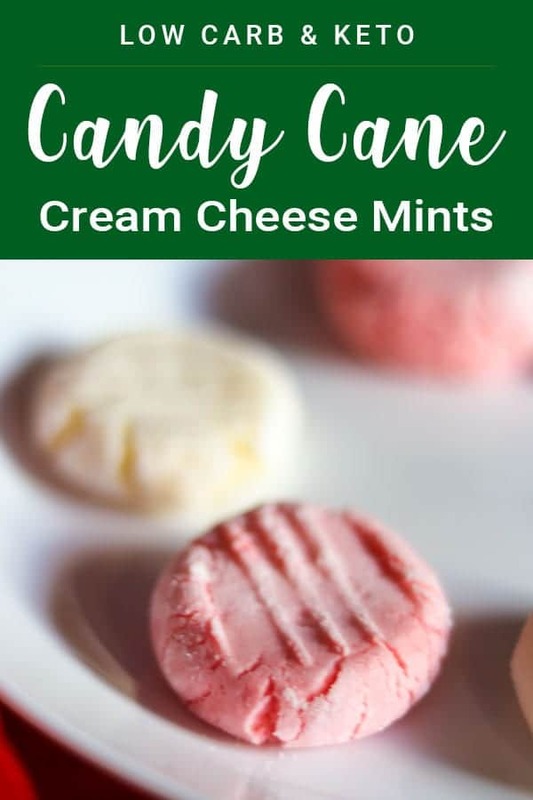 My Cream Cheese Mints recipe is the perfect mixture of sweet and satisfying -- no one will ever know they're low carb! With a hand mixer, beat together cream cheese and butter in a large mixing bowl until smooth. Gradually add in 1 cup of powdered erythritol and mix until combined (be sure to reserve ½ cup for later step). Add peppermint extract and food coloring. Beat until color is evenly distributed. Cover bowl with plastic wrap and place in refrigerator for a minimum of one hour. This will help firm up the mints. After cooling in the refrigerator, use a spoon or cookie scoop to form individual servings. Place them in a bowl with the remainder of the powdered erythritol and swirl to coat. This will make them much easier to roll with minimal sticking. With clean hands, roll the cream cheese to form small balls. Place them on a parchment lined baking sheet, about 1-2 inches apart. When all balls are rolled, take a fork dipped in erythritol and apply a crosshatch design on top. Use the tines of the fork (jagged edges) to make your design. Make sure that you are using peppermint extract. I find that most other mint flavorings taste a little too much like toothpaste. Want to make it easy? Do everything in a food processor. Don’t have powdered sweetener? Blitz the granular version in your food processor or blender. It mimics the texture of powdered sugar. When you add the powdered sugar replacement to the cream cheese & butter mixture, do it gradually. If you add it all at once, you may be left with a kitchen covered in a layer of erythrtiol. Another sweetener can be used, but the cooling effect of the erythritol works extremely well when paired with the peppermint extract. When cooling these in the refrigerator, a baking sheet lined with parchment paper or waxed paper works great! Planning on using candy molds? Instead of small balls, you may need to roll them at a different size. Make sure you have enough mixture to fill them. Keep the carb count low by using certain brands of cream cheese. They can vary from 0g to 2g carbs per serving. I usually go with the Philadelphia brand based on the flavor and 1g carb count. Make sure you have enough room in your refrigerator to cool — especially if you’re doing a big batch on sheet pans. Have you peeped the nutrition info? These are great as a fat bomb! When all is said and done, what’s more impressive than homemade mints? No one has to know how simple it was! What’s your favorite Keto dessert? Comment below! This is a yummy desert! So easy to make and guilt-free at that! I tried it and even the kids loved it. Thanks for sharing this yummy recipe! Thanks for sharing this candy cane cream cheese mints recipe! I’m sure my kids and niece will love these! These sound yummy! totally sharing and pinning for when my Keto diet starts back, lol. By the way, you should join our linky party each week on Monday and share your recipes. Click the latest round up post on my blog to join. This week is the holiday village post. Thank you! These look great and I can’t wait to make them!